Both delicate and feminine this crystal and pearl floral vine is set on a white ribbon that can be worn as a Belt or Headband to embellish your look. 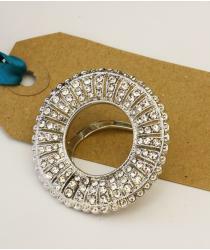 UK deliveries are sent via UK Mail and Royal Mail and may require a signature on delivery. For any items that fail to be delivered, a card will be left and the item returned to the local Royal Mail depot for personal collection or redelivery. Any items not collected within 3 weeks will be returned to us and you may be liable for charges if the 28 day return policy has elapsed by this time. We are pleased to refund you in full or exchange and post for free, any unworn and unmarked items with original packaging in a saleable condition accompanied by the dispatch note within 28 days of the dispatch date. As these items are made specifically for your and to your own specification, we will deduct a return fee of £25 per Dress and £10 for any other item, so that the fabric can be reworked for new orders. Pleased return unworn and unmarked items accompanied by the dispatch note within 28 days of the dispatch date. We offer a Pre Production Swatch Service and would ask that all multiple orders be placed together to insure a perfect match. Sample dresses are also available for you to try before placing your final order so that you can check sizes and length. If you are unsure please contact us and we will be happy to help. Please contact us to discuss the alterations you need as well as timing. We will advise you where to return your items. We charge an alteration fee of £25 per Dress and £10 for any other item, plus standard return post. If you need the items back in a rush please let us know when you return the items and we may need to charge extra for express / next day post. Can I get a Refund for my Made to Order item? As these items are made specifically for your and to your own specification, we will deduct a return fee of £25 per Dress and £10 for any other item, so that the fabric can be reworked for new orders. Pleased return unworn and unmarked items accompanied by the dispatch note within 28 days of the dispatch date. We offer a Pre Production Swatch Service so that you can see the exact shade before we make your order so please contact us for this if a match is critical. Sample dresses are also available for you to try before placing your final order so that you can check style, sizes and length. If you are unsure please contact us and we will be happy to help. Where can I see / try your products? In One Clothing is currently only available online as we aim to keep our pricing competitive whist offering a very bespoke service. 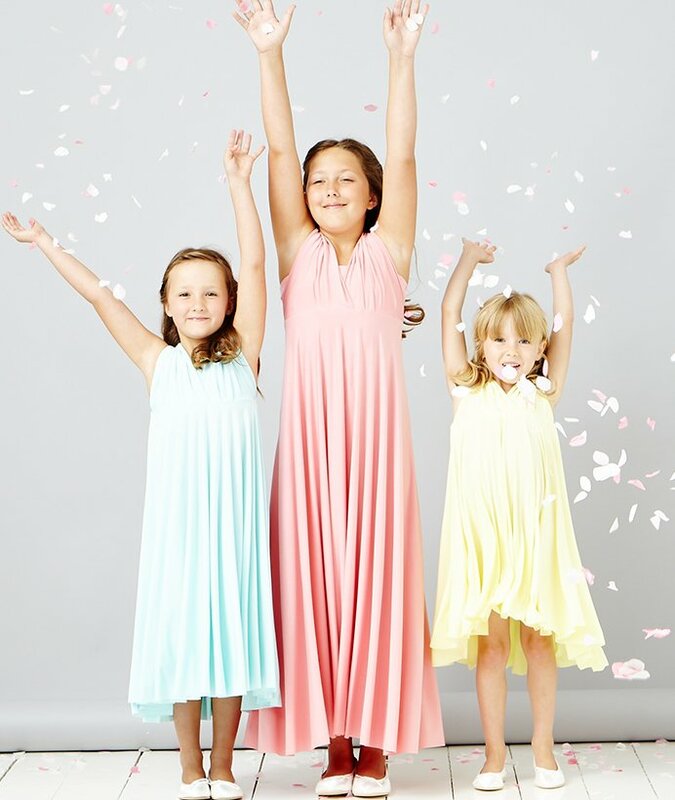 We do not have a store, but if you are considering our dresses for made to order, feel free to order a Sample Dress. Sample dresses are sent to your home with a bandeau top for you to try for 28 days and once you return it you get an gift voucher to use against you next order. Is the sizing true to size? All of our dresses are available in sizes S, M, L, XL and XXL. We want to accommodate all shapes and sizes. If you require a larger size, please contact us to discuss your requirements. For detailed Size Charts please see our Size Chart. Please note that if you are unsure between 2 sizes it is generaly better to opt for the smaller size as the waists are elasticated. For Maternity we offer a Maternity Range of Dresses and Tops that have extra give on the waist band and also added length on the front so the hems don't not ride up. These are ideal in you last semester. Before that we recommend that you order your pre pregnacy size as the waistband have some stretch. What if I need to change the size or length? We charge an alteration fee of £25 per Dress and £10 for any other item, plus return post. Please email us before returning the items so that we can advise on the return address and leadtimes. If you need the items back in a rush please let us know as we can trun these alterations around in a few days if needed. Can I see the colours of the fabric before placing my order? Fabric Swatches are available to order here. Please note that we cannot offer a dye to match service at the moment. We are happy to try and source the best match for you but cannot guarantee that we will find the exact shade you are after. Also note that shades do vary between dye lots so if colour match is essential please ask for a production sample to be send to you before we make the dresses. What are the Production and Delivery Lead times? What if I am in a Rush? Delivery dates for dresses and wraps ordered through the website are typically 5 to 7 days for stock items, and up to 5 weeks for Made to Order . We can 'RUSH' orders if you need a quick delivery. We are fairly flexible and hope to accommodate as many orders as possible. To rush an order please select the RUSH option on the checkout. Can I get Extra Fabric? Stunning Crystal and Pearl Silver Plated Wire set with white Ribbon ties that can be worn as a Belt or Headband. 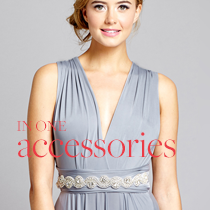 It is a perfect way to add a touch of sparkle and glamour to our multiway dresses . Wired vine is approximately 33cm long and 4.5cm wide . Dazling and Versatile Clip and Pin Brooch that will add a touch of sparkle to any outfit. Ideal f..